Having a lot of soccer data is great, but how do we use that data to find winning betting systems? This article will tell you about a new book that explains how to use the Betamin Builder football database to find profitable betting strategies that work and unveil eight new innovative football betting systems anyone can use. Tom Whitaker has published a second book in his Betaminic Guide series which is available as a free PDF on Betaminic or as a paperback on Amazon. (Download free here) This second book introduces a new multi-strategy system called the “Proven8” based on an improved research method to use the Betamin Builder big data analysis tool. The Betamin Builder is a free online tool that allows you to access a database of over 100,000 football matches from 54 leagues around the world since 2012. The Betamin Builder tool lets you analyze matches with an easy to use interface and find out if your gut feelings about soccer are true. For example, you can find out what happens if you bet there will be under 2.5 goals scored in matches where the home team is an underdog and the away team won their last game or more. The answer is you would have made a profit of 117 points if you had followed that tactic since 2015. In fact, you can follow that strategy yourself for free by signing up to Betaminic. (Sign up here) Sign up and click on the email box to get the future picks from that strategy sent to your inbox every time. That strategy is called “Under Home Underdog and Away Winner Streak”. 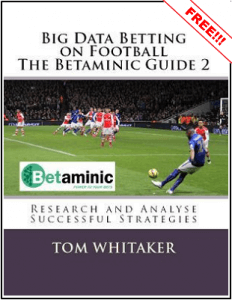 The Betaminic Book 2 “Big Data Betting” is a follow-on book from book 1 “Winning Betting Strategies”. The first book had a step-by-step guide to using the Betamin Builder Tool. It explained the Betaminic Public strategies in more detail and analysis. It introduced 21 new strategies made with the Betamin tool and showed that by using multiple strategies together, you could spread risk and reduce the chances of having a losing month while also making more points profit per month. That system is called the Colossus21. The first book also gave advice about betting bank control, staking levels and also troubleshooting advice to stay on track. The second book “Big Data Betting” introduces a new research method and also 8 strategies made with that method. This new system is called the Proven8. 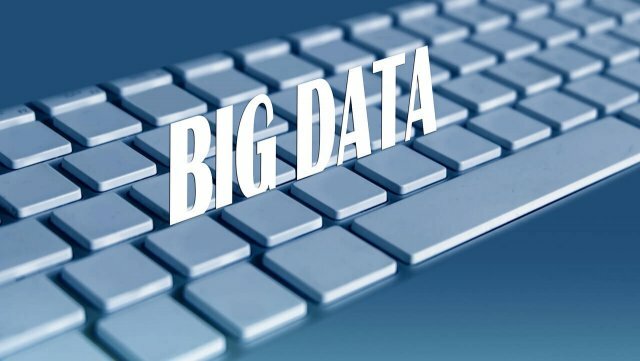 Big data has been used in sports betting for many years and a lot of people are making profit from it. In fact, not just individuals, but businesses and even financial investment companies. A Google search for “job opening sports betting trader” reveals many job opportunities. These organizations are not making money on random bets based on human feeling or in-depth knowledge of football. They are based on finding the patterns in soccer betting odds from their historical databases. They come up with a hypothesis, they research it with past data and then they test it. If it works, they make it an active strategy that will be one of many they have running in their portfolio of strategies. In the past, this kind of database was hard to build, maintain and keep up-to-date, so for most individuals it was a case of analyzing a few seasons of a few major leagues in excel files of their own making. Therefore it was only larger organizations or truly dedicated professional gamblers that could use big data and make profit with it with years of data covering many leagues. But Betaminic brings that opportunity to individuals who want to bet smarter. One of the biggest pitfalls of using big data for finding betting systems is data-mining. Data mining is where people think they have found a pattern, but in fact it was just a lucky run of events that has no basis on an actual pattern. For example, if you find that by betting on all football teams that being with the letter M, and it makes a profit, you instantly know from common sense that there is no special footballing power passed to football teams by the magical letter M. This is an example of data mining. We found a false pattern that was just luck. The Betaminic database has over 6 years of data in it. In the Betaminic Guide 2, a new methodology is explained that helps greatly reduce the chances of that. That method is to divide your historical data into two parts, a research period and a test period. Instead of researching with all data to 2018 and then live testing now to find out if a pattern exists, we can research with data until 2017 and then use the final year of data as our test phase to see if the pattern we found in the first 5 years continues or not. This very basic step can help us find winning strategies. Eight working strategies that were created this way and passed that test are presented in the new book and are ready to bet on just by following them on the Public Strategies pages. The new system is called the Proven8. You can see them here. Just sign up and you can follow these strategies by clicking on the email sign on the right of each strategy. These strategies are all premium strategies, so you can view them and review their past performance, but you cannot get their future email picks unless you purchase one of the pick packages. The main point of the book is to make profit as constantly and consistently as possible. No individual strategy is profitable every month, but when we combine many strategies together, that month’s winning strategies cover that month’s losing strategies and they balance out to give profit almost every month, and in those losing months to limit the losses. The Proven8 Test Period suggests it makes a profit in 89% of months. When we look at the Strategy Key Data Comparison table, we can see in column 8 that each individual strategy has been profitable for 55% of months up to at a best of 77% of months. But when all those strategies are used together in a multi-strategy system, they smooth out the ups and downs to 89% of months being profitable. The 9th column next to it shows the longest winning and losing streaks of each strategy an again you can see that the best individual strategy was PS4, which is the 4th strategy in the Proven8 system, which had a winning run of 19 months, and its longest losing run was only 4 months. But that would still have been a long 4 months if you were only betting on this strategy. But all the strategies together had an amazing winning run of 32 months and its longest losing run was only 2 months in a row. The above data is from 2012-2018. If we look purely at the Test Period data, the Proven8 system’s target is to make 18 points profit per month based on about 180 bets per month. That is an average yield of 10%. That is an above average return for professional bettors who often aim for a 4-5% ROI (Return On Investment). As far as betting systems go, you would find it hard to find anything with better results and transparency for the same price. Some betting systems offer tips, some offer trading methods, but it is hard to know when the profits will come or how the tipster is making his choices. But with Betaminic you know exactly the theory behind each strategy. You go into every bet with your eyes wide open to the risks and the possibilities. You are your own tipster. You are in full control. It is much easier to plan targets and to know when things are not working when you have this much data, this much Big Data, at your fingertips. Sign Up for free to access the Betamin Builder here. Download Book 2 for free here and read more about the Proven8 strategies. Find out how to get Book 1 for free on p6 of Book 2 or at the author’s website.